After watching of Lorraine Pascale's cookery programs, she's really got me inspired to bake bread. 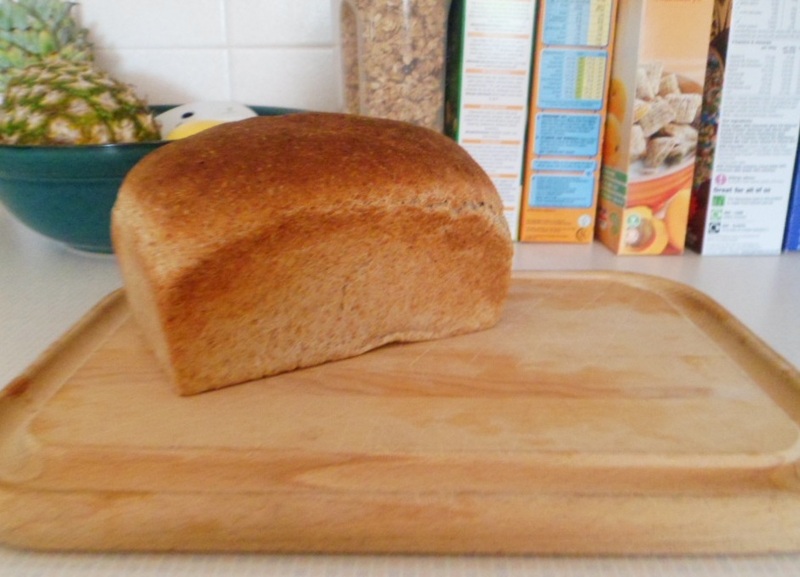 Admittedly, her bakes are usually flavoursome foccacias or tear-and-share bread but I chose to make a standard wholemeal loaf. Thought it would be a simple way for getting a feel for bread making. But I would like to start experimenting with different flavour combinations and ways of getting the perfect crispy crust and soft inside. I was almost baking blind with this as all I had was a simple recipe, a couple of tips and no experience. It went quite well, except it could have done with a bit longer in the oven! So any bread making secrets you have, I would be grateful for them! Put the flour, salt and yeast in a bowl. Make a well/hole in the middle and pour in the honey and oil. A tip for the honey is to put your spoon under hot water from the tap to warm it. This makes the honey slip off the spoon easier. Add the water and mix into a soft dough. I found the dough a bit dry so I added a touch more water. Once you dough has come together, put it onto a lightly floured surface and knead for 10 minutes. Once finished, put your dough into a greased loaf tin and cover with cling-film. Put it in a warm place to prove for 45-60 minutes or until it's doubled in size. When I made a loaf of bread mix before, I used the airing cupboard but I was luckily enough to have a very sunny windowsill. You could almost watch it rising! Preheat the oven to 220oC/430oF/Gas Mark 7. When watching Lorraine, I noticed her putting a tray of water in the bottom of the oven to create a steamy environment. I think this lets the bread rise before the crust become hard and crusty and stops it. But I think I may stop this until I more comfortable with making bread and know a bit more about it. When you put the loaf in, turn the oven down to 200oC/400oF/Gas Mark 6. The recipe said to bake for 25-30 minutes but I would say 30-40 minutes. It will be ready when golden brown and the bottom should sound hollow when tapped. Turn it out and leave to cool on a coolign rack. That's brilliant for a first loaf, well done! Look forward to seeing lots more interesting bread on your blog. this is the perfect loaf!